Investing successfully in a country requires understanding the country’s political capacity. Political capacity tells us about the ability of a country’s domestic actors ( government, business, civil society) to make and enforce agreements. The charts below reveal 4 ways to measure Enlightenedstan’s, Developingstan’s, and Failingstan’s political capacity to govern itself. The stronger each of these dimensions of political capacity is, the greater the capacity of the country to respond to existential threats. Distribution of power reveals who establishes and enforces the basic rules of the country. Civil society reveals the ability of the country’s public to form local associations, act in response to threats and opportunities, and exert pressure on their government. Governmental bureaucracy reveals the ability of the government to enforce the law and to provide public goods. Control of borders reveals the ability of the country’s military, diplomatic service, economy, and culture to filter influences from outside the country. As seen above, Enlightenedstan ranks 5 in Distribution of Power, 5 in Civil Society, 7 in Government bureaucracy, and 8 in Control of borders. •5 in Distribution of power indicates an emerging democracy, with a strong central state, rule of law, and democratic accountability. The institutionalization of the practice of democracy is not yet fully established and there is fear of return to rule by an elite. •5 in Civil society indicates many independent civic associations, with freedom to operate but weak capacity. Outside NGOs and funding are supplemental, not primary supports. •7 in Government bureaucracy indicates the national governmental bureaucracy is integrated into a regional governmental bureaucracy that is effective and efficient, with low corruption. •8 in Control of borders indicates the country is able to protect its society from most unwanted cultural foreign influences. Investors in Enlightenedstan can trust that contracts will be enforced anywhere in the country, in any industry. As seen above, Developingstan ranks 2 in Distribution of Power, 6 in Civil Society, 3 in Government bureaucracy, and 5 in Control of borders. •2 in Distribution of power indicates a fragmented society, with little violence. None of these three features exist at the national level: a strong central state, rule of law, or democratic accountability. •6 in Civil society indicates many civic associations, with freedom to operate and strong capacity. •3 in Government bureaucracy indicates local governmental bureaucracies have 2 of these qualities: effective, efficient, low corruption. •5 in Control of borders indicates the country is able to manage its guest worker, immigration or refugee flows, but is not able to protect its economic system against unwanted foreign influences. Investors in Developingstan will need to depend on city or regional governments, tribes, or civil society governance networks for contract enforcement because the central government is so weak. 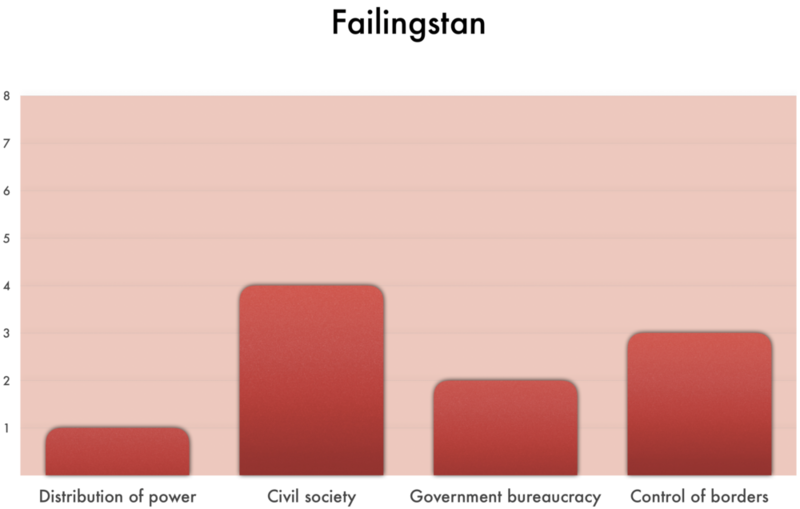 As seen above, Failingstan ranks 1 in Distribution of Power, 4 in Civil Society, 2 in Government bureaucracy, and 3 in Control of borders. •1 in Distribution of power indicates a fragmented society, with ongoing civil war. •4 in Civil society indicates civic associations exist, but outside NGOs and outside funding are essential supports. •2 in Government bureaucracy indicates most local governmental bureaucracies have 1 of these qualities: effective, efficient, low corruption. •3 in Control of borders indicates the country is legally recognized as an independent nation state, but is not able to protect itself against the mass murders of parts of the population by outsiders (invasion or bombing) or its own people (civil war). Investors in Failingstan will need to depend on a partnership of tribal or civil society governance networks with powerful regional or international actors for contract enforcement, because the central government and local governments are so weak. Enforcement will only be as strong as the partnership and the ability of the tribe or civil society actors to protect the venture. The civil war will be a continuous threat to the venture and every partner in the venture. In general, more developed countries rank higher in the four dimensions of political capacity, but not always. For example, Developingstan ranks higher on civil society than Enlightenedstan.